We all understand the law of diminishing returns. Especially when it comes to business. I don’t know if you’ve noticed but too many businesses spend too much time chasing what appears to be an ever decreasing pot of clients using a hope marketing strategy; that is that they hope they’ll find some business. And yet, just as the internet is offering up a whole load of competition for your business, it’s also the home of an increasing number of potential clients, as more companies and businesses are looking for alternative suppliers to fulfil their needs. It’s just that you don’t know who they are, and they don’t know anything about you either … yet! The reason most businesses struggle is because they don’t have a strategy for their marketing, they don’t know who their customers are; they often don’t know why their clients buy from them and they don’t know what makes people sit up and pay attention. They know that marketing themselves online is a good thing to do, but they don’t know how to go about it in a way that a. makes sense for their business and b. doesn’t eat up all their time. In short they’re stuck. Their potential clients have more opportunities than ever to give their business to an increasing number of hungry competitors. So, wouldn’t it be great if you had the inside track, the skills, the knowledge AND expertise to turn the world’s biggest and best professional social network into an effective lead generation tool? I know the feeling well. Back in 2008 I was also running my other business which works with both consumer and corporate clients. I too used hope marketing as my main marketing tool, hoping people would literally trip over me and want to do business. When I discovered the simple processes I now use online and put them into practice, my turnover literally quadrupled overnight, and it’s a strategy that been growing that business ever since. It was all because I worked out exactly who my customers were, both consumer and corporate; I found what they needed and matched my offering to those needs and then used LinkedIn to build strong, professional relationships that turned into leads and then into business. In fact, both sides of my business, the corporate AND the consumer, benefited from the same strategy. What I learnt along the way and whilst working with all my Internet Mentor clients over the years is that it’s a process any business can follow. It works in every market sector and for every type of business, regardless of who the end customer is. 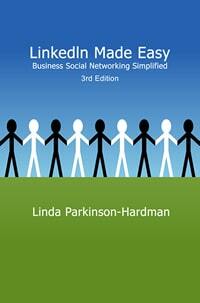 As the author of LinkedIn Made Easy: Business social networking simplified; the feedback from readers and clients through workshops, seminars and my professional development programme has been that they had never realised just how powerful a tool LinkedIn could be and that the skills they developed had helped them position themselves and their brand in the right way so they could generate more high quality leads that converted into great clients and customers. In the UK, over 15 million people use LinkedIn, that’s a quarter of the entire population. And the stats speak for themselves as LinkedIn has 2.74% more visitor to lead conversion than Twitter and Facebook and refers 50% of all social traffic to B2B blogs. In fact 91% of the all B2B marketers use LinkedIn, that’s a much higher percentage than on any other social network. In fact, using LinkedIn allows you to fill in many of the blanks in the sales process. For example it will give you a clearer idea of the size of your potential market, see the size of the team in companies you’re targeting and get a better understanding of their skills and expertise. It allows you to identify prospects and their colleagues by name, identify the right person to talk to and lets you see what they look like and even what their interests are. But LinkedIn isn’t just a place to mine for cold leads; it’s the one place online where you could make some serious waves, not only with your potential customers, but also in your own industry. It’s brilliant for building your brand, getting more people and companies to know who you are, what your business does and how well it does it. And it’s THE place to stand out as the ‘go to’ expert for your market sector. But, in order to use it effectively and get all these great benefits you do need to know what works, what doesn’t and why. And you really need to know what it is that gives conversion rates as high as 30%. LinkedIn Made Easy is a great starting place; although the front end of the site changes, the basic principles of networking online never do. It talks you through the various sections of the network and how to use them; and then gives you a set of handy ‘recipes’ for success you can tailor to your own unique needs.